by Danielle Ricks.In Apple, Blackberry, Gadgets, Mobile, Smartphones. The last we had heard in mobile app research was a forecast that there would be 25 billion downloads by 2015, and along the same vein, Nielsen has released the results of a survey of some 4,000 mobile users about their application downloading habits. As you’d expect, iPhone users were the most active, with an average of 40 apps installed, while those with an Android phone had 25. BlackBerry trailed significantly with an average of 14 applications, and across all platforms, the average worked out to 27 applications. Those numbers are all up from December, showing that even on BlackBerry, interest in mobile apps is growing. No surprise there. There was also a categorical breakdown of the kinds of apps people were downloading; games were at the forefront, with 61% of smartphone-owning respondents having downloaded one in the last month, followed by weather, maps, social networking, and music. 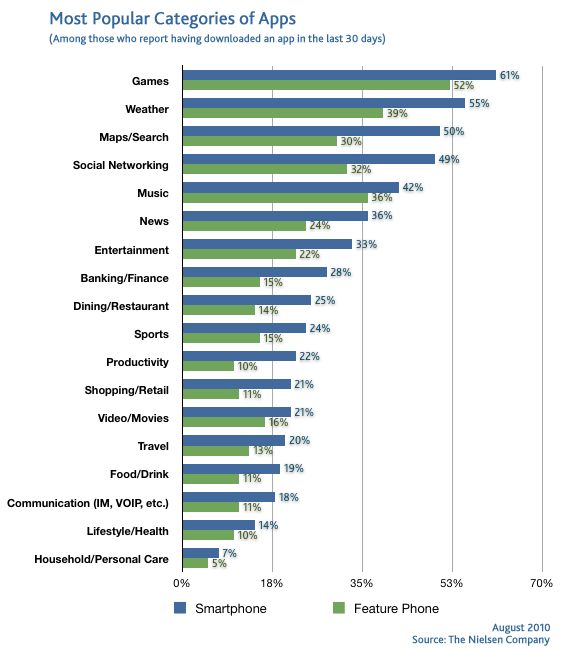 Facebook, Pandora, the Weather Channel, and Google Maps ranked among the top five used applications across all platforms. I wish there was more usage data published, as I would like to see how often downloaded apps are used on a platform-by-platform basis. I know that on BlackBerry, I have a select few apps, but I make use of them pretty regularly, while my iPod Touch is loaded to the gills with applications that I’ll use maybe once every two months (if that). My brief experience with Android is somewhere in between; maybe half I’ll use with any consistency, and the others are highly situational. Average per-device application downloads rank in the same order as the size of their respective app stores. At last count, the iTunes App Store had a buxom 250,000 iOS apps, the Android Market sat comfortably in the middle with 80,000 titles, and BlackBerry App World recently broke 10,000. Obviously if user activity is high, developers will be more interested in getting into the app store, overcrowding be damned.